Car nicknamed the 'Batmobile' sells for £14 million, making it the world's most expensive car. 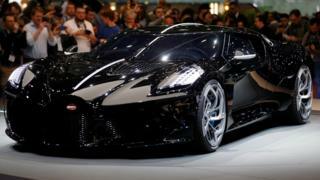 La Voiture Noire - which means 'black car' in French - was on display at the Geneva International Motor Show, which showcases some of the priciest cars in the world. The car can reach speeds of 261 mph and has an eight litre engine, which sounds cool, but isn't a patch on Batman's famous car - for one, it doesn't even come with a crime-fighting sidekick! The buyer of the car hasn't been named and we don't want to jump to conclusions, but if we've learned anything from all those comic books: secret identity + elaborate ridiculous car = superhero. If you were able to get around like a superhero, whose method would you choose? Would YOU pay $1,500 for this ice cream?